After a rough day at work or school, you hop on your bike and something magical happens as you move through the city dodging cars and feeling the wind. By the time you arrive at home, somehow you are transformed: your mood has been uplifted, you feel energized, and your mind is clear. This is a common experience that motivates us to keep riding again and again. Why does riding a bike have such an effect on us? The vast majority of the human mind is not unlike a cluttered house, because as soon as we are born into this world, we start learning, accumulating, adapting, and creating rules to make sense of our surroundings. Our mind loves to do three things and three things only: It wants to Get, Hold, and Have More. This is not necessarily a bad thing, but actually a very healthy mechanism of the mind that enables us to function in this world efficiently. For example, we learn how to recognize letters and words (Get), and remember the definition of the words (Hold) and expand our vocabulary (Have More). But somewhere along the way, the mind becomes out of control, and it takes over our lives. If you doubt that your mind controls you, instead of you controlling your mind, try this simple experiment: Close your eyes and watch your thoughts. What are you thinking about? Can you stop the mind from thinking or worrying about something? Can you “turn off” your mind? When you are angry, sad, obsessed, worried about something, try directing your thought to another subject of your choice. Can you confidently switch your mind from the upsetting thought and keep it from going back? The mind hates being still, for many reasons, but mainly because its primary function is to Get, Hold, and Have More. It’s a workhorse, and it’s perfect for some things, like driving or reading a book. And by the time we are grown up, the mind is on auto-pilot. It becomes problematic when we lose control of the mind. The only difference between an enlightened person and an unenlightened person is that the former has total control of one’s mind, and the latter doesn’t. In the Zen tradition, this problematic mind is sometimes referred to as the Bull. Most of us don’t even know that a Bull lives and dictates our life. The trick is to recognize this Bull and learn to tame it, control it, and ultimately lose both the Bull and the Self. This is cool stuff, but it is digressing a bit from the topic. The reason we feel so good after biking, especially in an urban setting, is because we are forced into the present moment while we are riding. There is a real danger of getting hit by a car or smashing into a pothole if we are not paying attention. The mind loves to think about the past—how it could or should have been different, or longing for that “high” experience that we never seem to be able to recapture. It also loves getting lost in the future. Either worrying about an unwanted outcome, or hoping for a favorable result, it keeps going and going, often in an infinite loop. But all that activity is suddenly pushed aside by the busy intersection you are about to enter. The mind cannot think about more than one thing at a time. When we are quickly maneuvering around that abruptly stopping taxi in front of us, we cannot be wondering about that nasty remark your neighbor made yesterday. Here and Now. 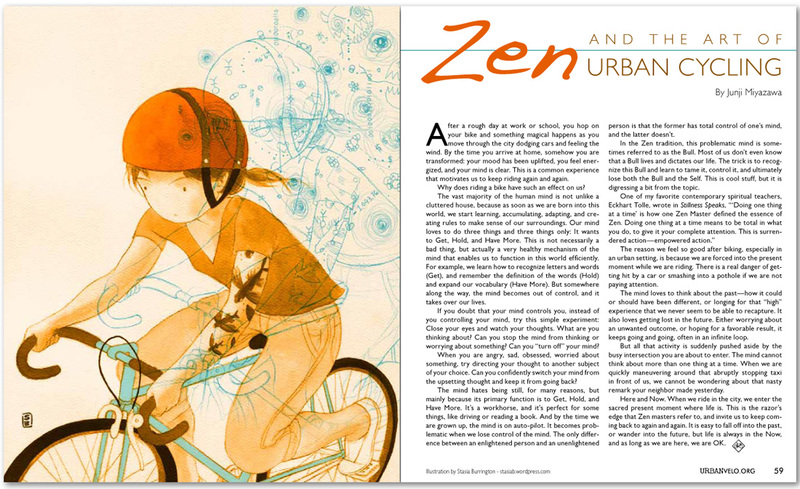 When we ride in the city, we enter the sacred present moment where life is. This is the razor’s edge that Zen masters refer to, and invite us to keep coming back to again and again. It is easy to fall off into the past, or wander into the future, but life is always in the Now, and as long as we are here, we are OK.